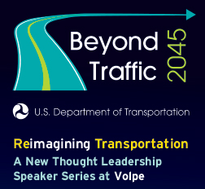 Delve into the trends that will transform transportation with Volpe’s new speaker series—Beyond Traffic 2045: Reimagining Transportation—starting September 18. The series kicks off with a special video introduction from U.S. Transportation Secretary Anthony Foxx and opening remarks by Assistant Secretary Gregory Winfree. The series will open with Dr. Andrew McAfee, principal research scientist and co-founder of the Initiative on the Digital Economy at MIT and co-author of The Second Machine Age: Work, Progress, and Prosperity in a Time of Brilliant Transportation. With a special video introduction from U.S. Transportation Secretary Anthony Foxx and opening remarks by Gregory Winfree, U.S. DOT Assistant Secretary for Research and Technology. Dr. McAfee is a principal research scientist and co-founder of the Initiative on the Digital Economy at MIT and co-author of The Second Machine Age. Join us via webinar or in person. Interested in viewing all of our articles? Visit our news page. Dr. Aaron Hastings, Christopher Roof, and Eric Boeker presented papers on environmental modeling support tools, a unique acoustic propagation verification and validation data set, and the auralization of moving sources at INTER-NOISE 2015, the 44th Inter-Noise Congress and Exposition on Noise Control Engineering, held August 9-12 in San Francisco, California. Dr. Scott Gabree and Bianka Mejia participated in a panel discussion at the 2015 Right-of-Way Fatality and Trespass Prevention Workshop, held August 4-6 in Charlotte, North Carolina. Dr. Gabree discussed potential countermeasures to mitigate suicides on railroad rights-of-way. Mejia discussed the impact of media on suicide rates and what the rail industry can do to encourage responsible reporting. Michael Scarpino participated in the 2015 National Clean Cities Coordinator Training Workshop, held September 1-3 at Argonne National Laboratory in Lemont, Illinois. Scarpino discussed fuel tank cylinder safety standards for natural gas vehicles and industry best practices, as they relate to compressed natural gas transit buses.